In the opening match of VIVO Indian Premier League 2019 (IPL 2019), Mahendra Singh Dhoni's Chennai Super Kings (CSK) defeated Virat Kohli's Royal Challengers Bangalore by 7 wickets at MA Chidambaram Stadium in Chennai on Saturday. Chasing a below-par score of 71 runs, CSK lost opener Shane Watson early but never looked to control the game as Ambati Rayudu (28 off 42 runs) and Suresh Raina (19 off 21 balls) put 32 runs for the second wicket to consolidated their team position. 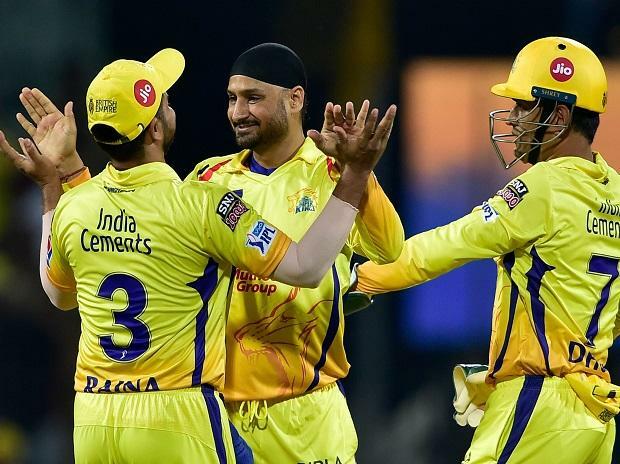 Earlier, Harbhajan Singh rocked the top-order with a three-wicket burst as Chennai Super Kings bowled out Royal Challengers Bangalore for a paltry 70 in 17.1 overs in after winning the toss. On a slow Chepauk turner, the senior off-spinner opening the bowling, rolled back years with figures of 3/20 in his four-over spell that deflated Virat Kohli's men completely. Once Harbhajan had wreaked havoc, Imran Tahir (3/9 in 3 overs) tormented RCB even more with his traditional leg-breaks to kill the contest in the first half. With so much assistance for spinners, Ravindra Jadeja wasn't going to be left behind, finishing with 2/15 in 4 overs. Skipper Mahendra Singh Dhoni's inspired move to open with Harbhajan paid brilliant dividends as he removed rival skipper Kohli (6) in the fourth over and RCB never recovered from that early blow. Having gauged the pace of the pitch, Harbhajan altered the length of his deliveries effectively and also reduced the pace to trouble the batsmen. While he was lucky as his off-break dropped short but Kohli's mistimed pull-shot was taken by Jadeja at mid-wicket boundary. It was the perfect platform for Tahir and Jadeja, who looked unplayable with the pitch offering reasonable turn and the lower-order's confidence shot to pieces.